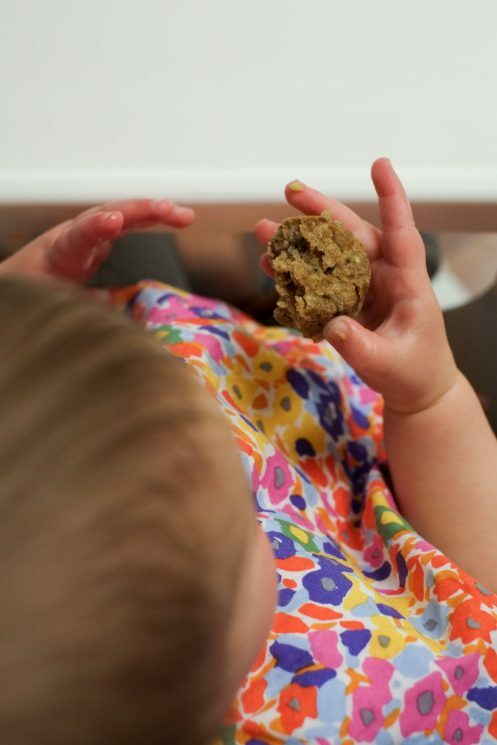 Kids love muffins – and now they just got better! 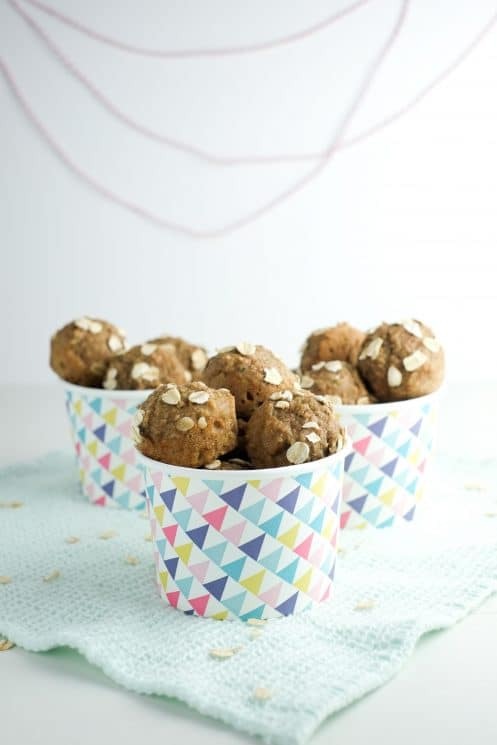 Muffin bites are ideal for on-the-go snacking or road trips because they’re less messy than regular muffins. 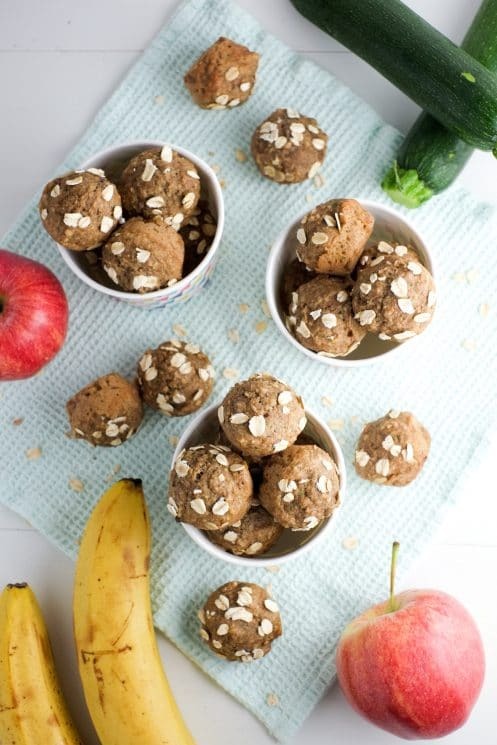 Plus, we’ve packed our muffin bites with fruit, veggies, oats, and whole wheat for a tasty and nutritious snack. 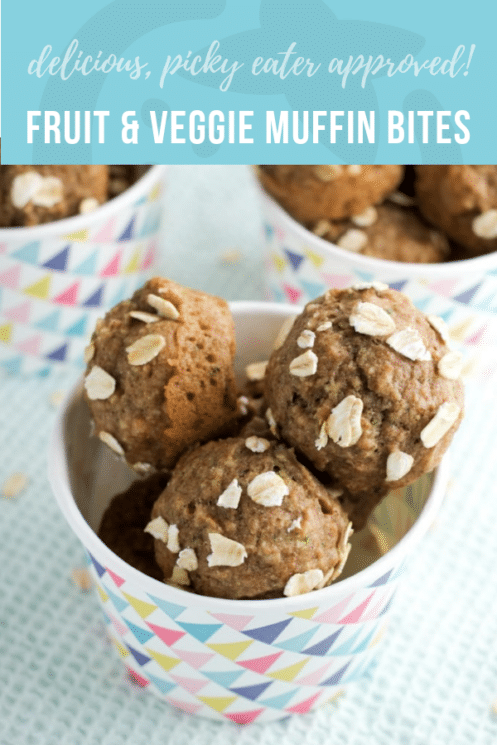 Here’s one great option for you: fruit and veggie muffin bites! Bag a few up and you’re good to go. Bite-sized muffins mean less mess – muffins in bite-sized pieces don’t need breaking apart, so no crumbs! No white flour, only ground oats and whole wheat. Apple and banana provide lots of natural sweetness, so we’ve cut down on the amount of added sugars these have (only 1/2 cup of honey/maple syrup/sugar in a batch of 50!). Snuck a veggie in there – zucchini (kind of like banana-apple-zucchini bread). Lots of fiber for good digestion from the oats, whole wheat, apple, banana, and zucchini. Also a good source of vitamin C, which is important for growth, immunity, and healing. Just a bit of fat to help with vitamin absorption (2 tablespoons of coconut oil or butter – both work!). Plus, who doesn’t love muffins? Most kids love them! Muffins are one of those things I have to be careful not to eat to much of when I make them… so making them bite-sized also helps me with portion control! Added bonus: they’re the perfect size for my 1 year old! First, preheat your oven to 375* F. Grab a mini muffin tin and a food processor (or pretty decent blender). 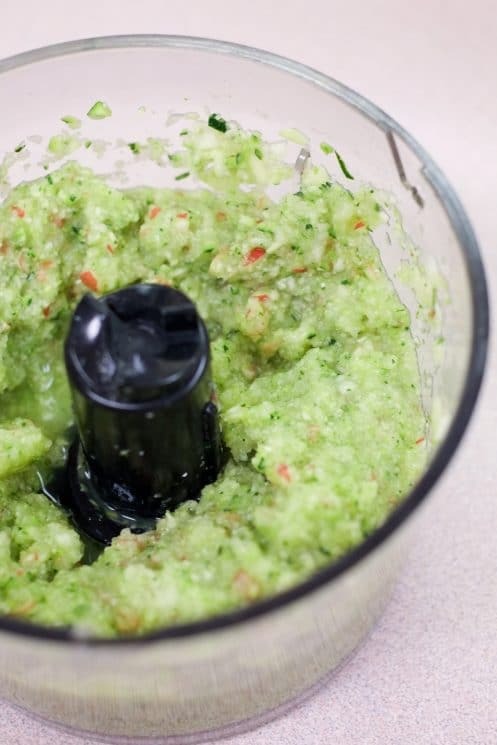 You’ll use a food processor not once, but twice. Food processor 1: Blend up 1 cup of rolled oats for a few minutes, scraping the sides when needed. You want an almost flour-like consistency, but it won’t be quite that fine. Pour the oat flour into a large mixing bowl. Note: If you don’t have oats or don’t want to use them, you’re welcome to use more whole wheat flour in its place. Food processor 2: (No need to clean it between steps.) 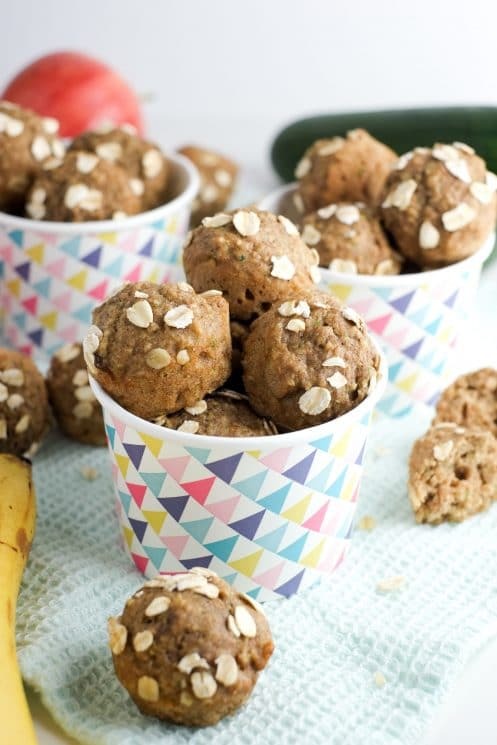 Add 1 cup of chopped zucchini, 1 cup of chopped apple, and 1 banana (very ripe!). Blend well. Now add 2 eggs, 1 teaspoon of vanilla, and 3/4 cup of milk. Blend again. Leave this mixture for a minute. Note: If you have a small food processor like me, you may need to just puree a few things at a time, and that’s fine. 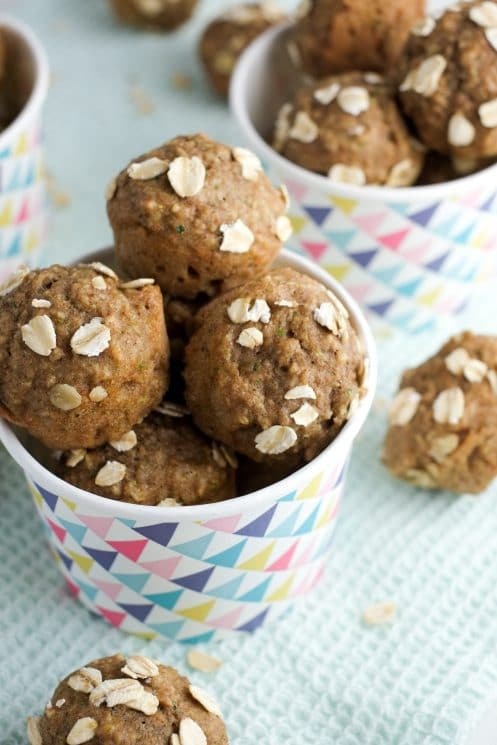 To bowl with the oat flour, add 2 cups of whole wheat flour, 1 teaspoon baking soda, 1/2 teaspoon of salt, and 2 teaspoons of cinnamon. Stir together. Now add the blended fruit and veggie mixture to the large mixing bowl with the flour. Also add 1/4 cup of melted butter or coconut oil, as well as 1/2 a cup of honey, maple syrup, or sugar. Mix everything together until thoroughly combined. Spray your mini muffin tin with cooking spray, then fill each muffin spot almost to the top. Bake for 10 minutes and remove right away to a cooling rack. Repeat until batter is gone. Once cooled, store muffin bites in plastic bags for 3-4 days, or freeze leftovers. This recipe makes about 50 muffin bites. Grab a bag and hit the road! 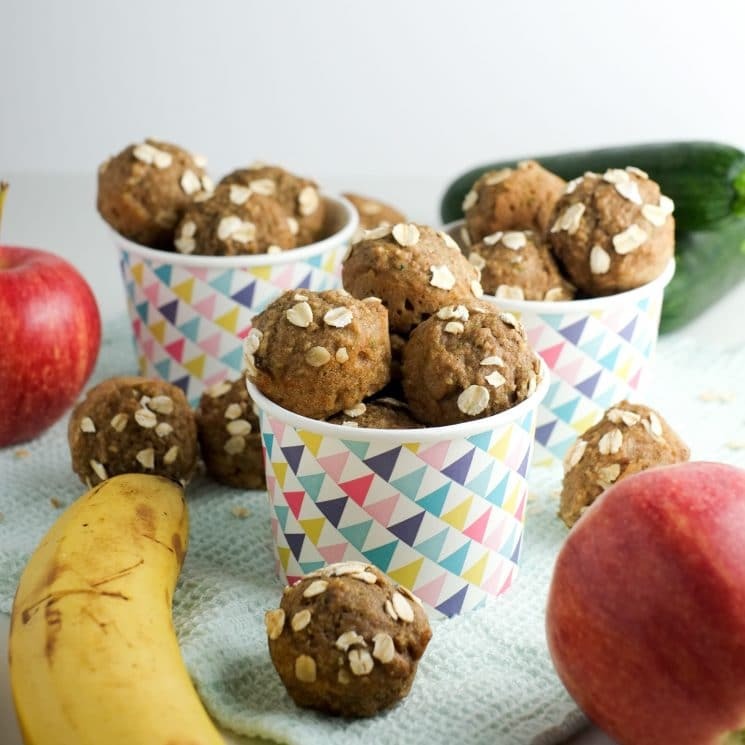 Feel good that your kids will have some healthy, tasty, clean snacks to fuel their fun. Preheat oven to 375* F. Roughly dice a zucchini and apple – you need one cup of each. 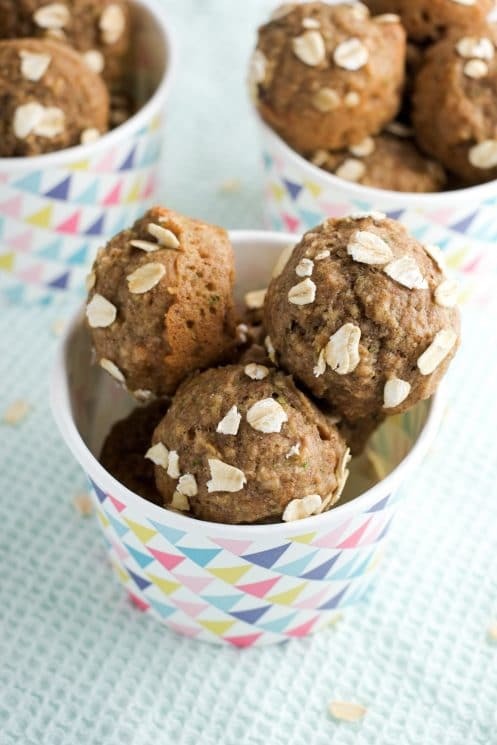 Blend 1 cup of rolled oats in a food processor or blender until flour-like. Pour into a large bowl and set aside. 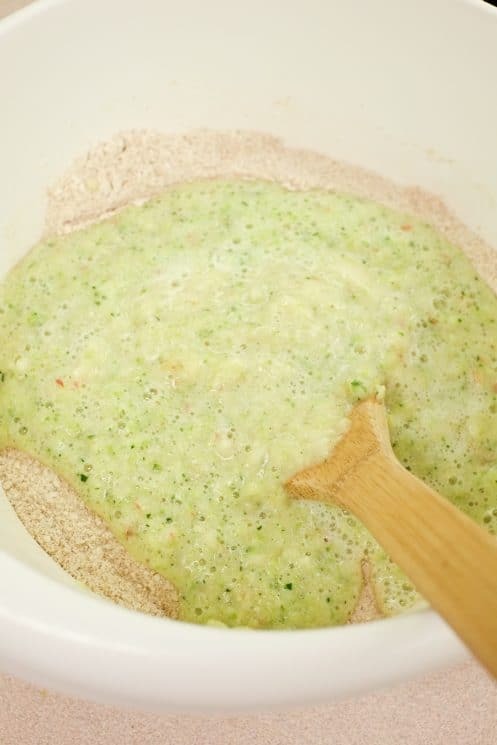 In the same food processor (no need to wash), blend 1 cup of apple, 1 cup of zucchini, and one medium (very ripe) banana. If there’s room, now add the eggs, vanilla, and milk and blend (any kind of milk will work). Leave the mixture aside for a moment. Now add the following to the large bowl with the blended oats: whole wheat flour, baking soda, cinnamon, and salt. Stir well. Add the wet ingredients to the large bowl with the dry ingredients: blended fruit and veggie mixture, sugar (honey or maple syrup also work), and 1/4 cup of melted butter OR coconut oil. Mix well. Spray a mini muffin tin with cooking spray, then spoon the mixture in. Fill each muffin spot almost to the top. Bake for 10 minutes, or until a toothpick comes out clean and the sides just begin to brown. Remove onto a cooling rack. Repeat until the batter is gone. If I wanted to make regular sized muffins how long would I cook? I haven’t tried as regular sized muffins, so I don’t quite know. The way I’d do it is cook them for 15 and then check periodically until they’re done — I would expect sometime between 20-25 minutes maybe? Let us know if you try it! Glad you like them! I actually just defrosted a bag — I put it in the fridge overnight. For quicker defrost, you can probably microwave a handful of them for maybe 20 seconds (I’d do 10-15 second increments and check to see when they’re done). These are so yummy, I’ve made them with maple syrup for sugar and Avocado for butter. Kiddos and I want to eat them all LOL. Also I do not have a mini muffin pan therefore made them regular size and took about 23 minutes to cook if anyone wondering. 35g of sugar per serving? Almost equivalent to a can of coke. What is a serving? Hi Maria! Thanks for your comment! That is really high! I’ve fixed it. Depending on the size you make your bite, 2 or 3 bites are a serving. The recipe will make more, but you can freeze them for later! How do you get them in the little cute ball shape? I was wondering if I could substitute boiled, mashed sweet potato for the banana? These look absolutely scrumptious, but I have a family member who can’t eat bananas. Love these! Second time making them. Used a little less than 1/2 cup of honey in place of sugar, and melted coconut oil in place of the butter. Haven’t had a chance to freeze any yet…hopefully this time! I might try a carrot in the mix next time! Can I use unsweetened applesauce in place of the honey/sugar? I am wondering how you got them in the ball shape mine you couldn’t shape them at all more like muffin batter.